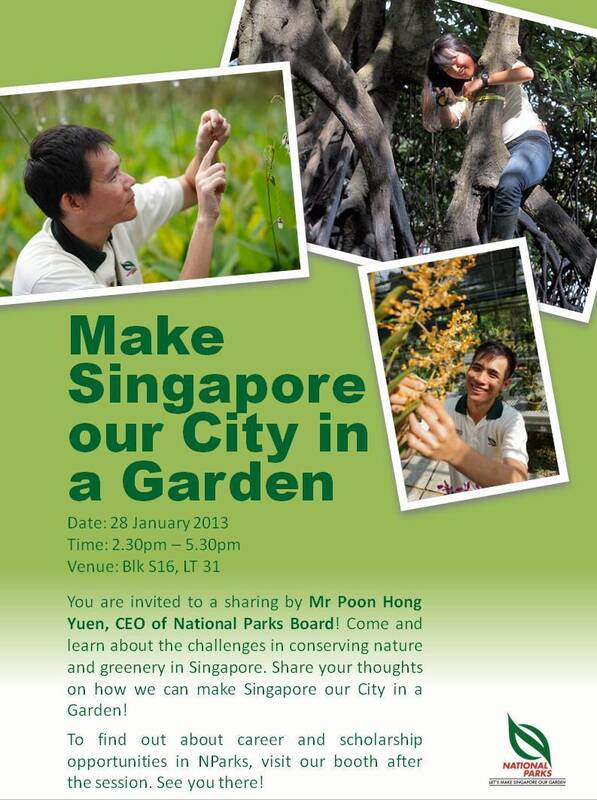 He will also share about career and scholarships opportunities in NParks. I quickly confirmed the exact location of the carcass with Weiting, showered hastily and headed over to Plant Systematics Lab to borrow the department’s vehicle [they always seem to have the vehicle when you need it – thanks Alex], grabbed some supplies and rushed down to the site. 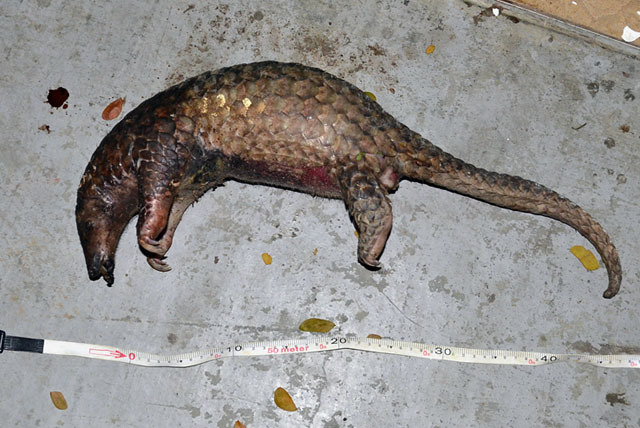 The juvenile female Sunda pangolin (Manis javanica) or scaly anteater was bruised around the front quarter and seemed to have suffered internal bleeding, injuries most probably caused by a vehicular collision. A few passersby stopped to look as I was taking measurements and pictures, one remarking that it cannot be real and another asking what I was doing. This gave a good opportunity to talk with the public about the wildlife around their estate. Petir Road is surround by two forested nature reserves. Petir Road is cut off from the forested Central Catchment Nature Reserve (CCNR) by the six-lane Bukit Timah Expressway (BKE) on the east, and is surrounded by various green areas such as Bukit Timah Nature Reserve (BTNR) and Dairy Farm Nature Park to the south. Vehicle traffic is certainly a threat to animals that move out of the forest onto the roads. Meanwhile, an ecological corridor that connects BTNR and CCNR over the expressway is being constructed and should be ready by the end of 2013. This is the second pangolin carcass I have picked up around this area. 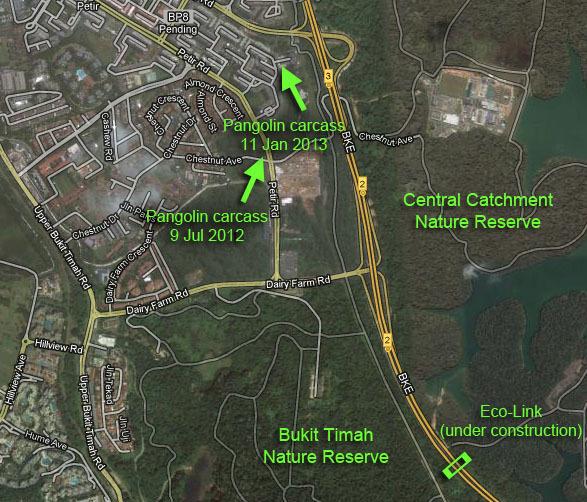 On 9 Jul 2012, a member of the public informed us about a larger male pangolin along Petir Road. We depend largely on public information for sighting records and are happy when we get reports of members of the public observing wild animals in their habitat. However, body snatching operations are something we do not enjoying doing as we prefer to see animals alive, but we try not to pass any over owing to scientific value of animal carcasses for research in urban Singapore. Carcasses are deposited at the Raffles Museum of Biodiversity Research for preservation. We thank the member of the public who informed us of this. To report a road kill or sighting, email mammal@sivasothi.com or call the Raffles Museum of Biodiversity Research at 6516 5082. A photo or description of the animal, its general condition and detailed location would be most useful. We are currently seeking to fill a number of research positions to meet emerging challenges and opportunities in this area of rapid growth. Successful applicants will increase the capacity of core expertise in freshwater biomonitoring in Singapore at TMSI, NUS developed through targeted programmes over the last five years (http://rmbr.nus.edu.sg/dna/activities/details/26). Experience in freshwater research in South East Asia would be preferable. However, applicants with relevant skills in quantitative ecology and/or freshwater research elsewhere will be considered. One of the core areas of research undertaken by the Inland Waters cluster centres on an operational biomonitoring programme and its application to the ecological assessment of Singapore’s freshwaters. To assess and effectively monitor change in freshwater ecosystems an understanding of links between local environmental conditions and faunal assemblages is required to establish locally relevant indicators, thresholds and targets. A range of projects on the development, validation and application of bioindicators are currently developing a base network of ecological data across Singapore’s freshwater ecosystems. The research fellow will work with existing teams to support applied research objectives on ecological assessment and further cross-project research on the interaction between environmental conditions, habitats and aquatic fauna. A proven track record in quantitative freshwater ecological research, study design, analysis, interpretation and scientific writing is required. Experience in multivariate statistical analysis is essential, preferably with a strong background in the modeling of faunal response to environmental conditions and/or environmental impact assessment. The ideal candidate will have experience in working with benthic macroinvertebrate, fish and/or phytoplankton community data, biotic indices and a good general knowledge of aquatic ecology. At minimum, applicants should have a PhD in the field of freshwater ecology. This position is for an 18 month fixed-term position with opportunities for subsequent extension based on successful acquisition of funding in line with the long term objectives in the Inland Waters research programme. The successful applicant will work on a 3 year research project focusing on linking catchment hydrology models to biological responses to determine the ecological effects of climate changes and management scenarios withinSingapore’s freshwater swamp forest. This cross-disciplinary research is being conducted with team of hydrologists, ecologists and geographers at the National University of Singapore in collaboration with local governmental agencies responsible for conservation of biodiversity and water resources. The research fellow will be responsible for developing models that capture knowledge of the relationships between environmental conditions and ecological responses. The appointee will lead a team of research assistants in field sampling of freshwater fauna to yield quantitative community data. These data will be used to investigate the links between community structure, aquatic habitats and hydrology to develop models of biological response to changes in hydrology. The appointee will work closely with a hydrological modelling team to link these faunal response models to hydrologic model output. A strong background in the modeling of faunal response to environmental conditions is therefore essential. The ideal candidate will also have experience in quantified collection, identificationand analysis and interpretation of benthic macroinvertebrate and fish community, hydrology and habitat data and a good general knowledge of aquatic ecology. The research fellow will be responsible for progress and scientific reports as well as development of research publications. Demonstration of team leadership, co-ordination and timely delivery of project reports as well as a proven track record of peer reviewed publication of research is highly desirable. This is a three year fixed-term position. Individuals with a PhD in the field of freshwater ecology, hydrological or water quality modelling, ecological response modelling and demonstrated ability to work within a cross-disciplinary team are invited to apply. The minimum qualification for research assistants is an undergraduate degree in a relevant subject area. For the Research Associate positions, applicants should have, at minimum, a MSc in a relevant subject area with two years relevant post-qualification experience. We are seeking Laboratory Technicians to join our programme of freshwater sampling across Singapore. Ideal candidates will have experience in biological, ecological or environmental field work, collection and maintenance of water samples and/or biological specimens and data as well as experience of working in a laboratory environment preferably holding responsibility for aspects of laboratory management. The following responsibilities are undertaken by a team of Laboratory Technicians within the Inland Waters cluster. Fieldwork and processing of biological samples are undertaken by all Technicians and Research Assistants. Depending on experience, Technicians may elect to specialise in aspects such as health and safety management, specimen curation or database maintenance, for example. Candidates are therefore requested to indicate any areas of specialisation when applying for these positions. A relevant polytechnic diploma or equivalent qualification is the minimum requirement for these positions. Experience of fieldwork and parataxonomy is preferred though training in field methods and identification of taxa will be provided. A conscientious attitude to laboratory work and competence in working outdoors is essential. Proficiency in Microsoft Office applications such as Word, Access and Excel. Self-motivation and an ability to work independently as well as a with other team members. Interested candidates are invited to email their resume and cover letter FAO Dr. Esther Clews to tmshr@nus.edu.sg. Please indicate in the subject heading the position applied for with Inland Waters, EMID e.g. “Research_Assistant_ Inland_Waters_EMID”.